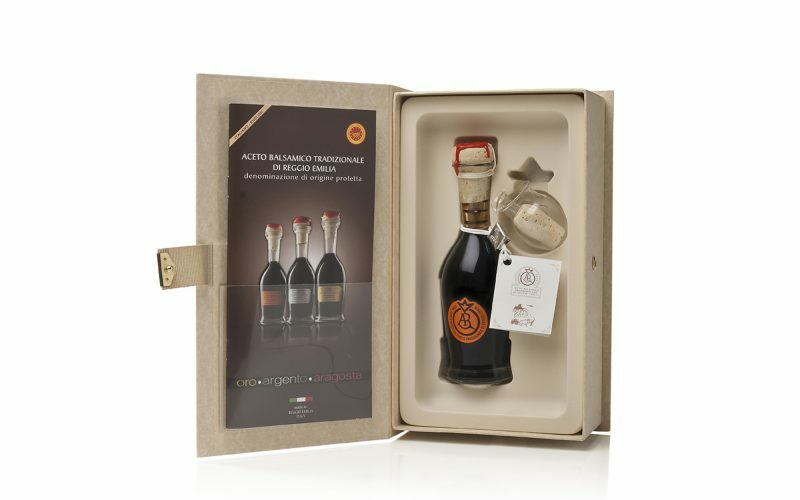 The Traditional balsamic vinegar of Reggio Emilia Aragosta (Lobster) label is aged at least 12 years. It is the first step of a stair toward perfection. This balsamic vinegar is transferred from barrel to barrel coming in contact with 7 different type of wood. It is pleasantly sour and brisk and all flavours are perfectly balanced with the sweetness. In spite of the complexity, it can be taste with delicate dishes, carpaccio, vegetables and salads. It can be used as flavour for seafoods and beef.